We understand that clowns are supposed to be creatures of comedy. Actors going over-the-top with slapstick for a few laughs. But some of us have also watched movies where the clown is a psycho. So while half of the office smiles at even the mention of a clown's shoes, the other half is covering their eyes and trying to avoid talking about it. Regardless of your clown bias, if you're dressing the part you'll need all the accessories. And one item that definitely shouldn't be forgotten is the clown shoes. A clown with normal shoes is hardly a clown at all. 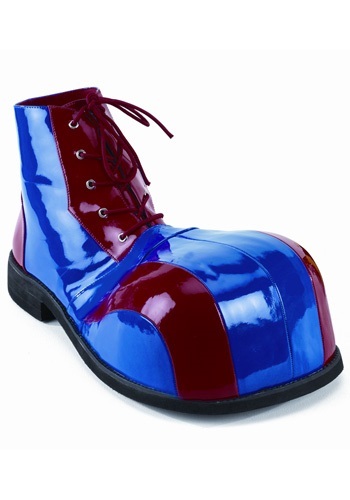 Here we have Blue and Red Clown Shoes that are ridiculously long with big bulbous toes. And even if we tell you they have non-slip soles, we're pretty sure some of you clowns are going to be tripping anyway. But that's okay. We ...well only some of us... will love you anyway. These are a great product! I see why they are in high demand!!! They look awesome and fit great I love em.